GAP YEAR IN GHOST TOWN is Michael Pryor’s forty-fifth novel (? Forty-sixth? Fiftieth? WHO KNOWS. Michael has published literally dozens of books) for young people. You might have heard of his work previously, with books like The Laws Of Magic series, or the Quentaris Chronicles, or The Extraordinaires, or one of his many other stories – Michael is well known as one of this country’s premier spec fic authors. Michael’s work has been shortlisted for the Aurealis Award six times and been nominated for a Ditmar: he’s also had six of his books listed as CBCA Notable Books. He writes (seemingly effortlessly) across category from junior to YA fiction. You might have encountered his short stories in Aurealis, or in anthologies like Begin End Begin: A #LoveOzYA Anthology – his story ‘The First Casualty’ was a highlight of the collection for me. 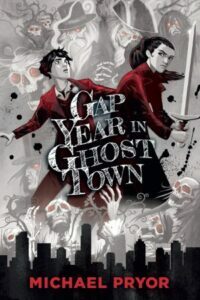 GAP YEAR IN GHOST TOWN is the story of Anton, who’s not so much ‘called’ to a life of ghost-hunting as dragged. His dad has encouraged Anton to give the family ghost-hunting tradition a proper run during Anton’s gap year between high school and university. And where better to hunt ghosts than on the streets of contemporary Melbourne? But things start to get complicated when another ghost hunter, Rani, comes to town – and then, when a supernatural murder occurs, things get really complicated. I’m really excited to read this book, and I’ve heard so many good things! If you’re as excited as me, get yourself over to Boomerang Books and use the ‘loveoz’ promo code to get free shipping on your order of GAP YEAR – and happy ghost hunting!